Next year marks the 20th anniversary of live nativity scene. The ‘Little Angels’ from St Joseph’s Nursery and the Lucan Gospel Choir were drafted for this year’s official opening of Dublin’s Live Animal Crib. The Lord Mayor thanked the Irish Farmers’ Association and Dublin City Council for their generous gift to the city. “The Crib represents a small piece of the countryside with the live animals nestled in a comfortable and safe life-sized stable. It is a great opportunity for families to come into Dublin City and enjoy this simple traditional nativity scene,” he said. IFA President, John Bryan, who was also present said that the Live Animal Crib at the Mansion House has “an enduring appeal for families” and is very much central to the Christmas experience in the city. “Next year marks the 20th anniversary of this traditional nativity scene which farmers have gifted to the people of Dublin as a symbol of our largest indigenous industry. It also raises funds for some very worthy charities,” Mr Bryan said. 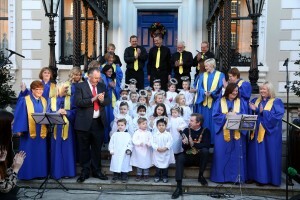 The Crib has been a joint venture between Dublin City Council and the Irish Farmers’ Association since 1995. It is specially constructed by Dublin City Council’s Housing Maintenance Section as a life-size stable so that it can contain sheep, donkeys and goats. The animals are brought in each morning and returned to a farm on the outskirts of the city each evening. Admission is free, but any voluntary contributions from the public will go towards the Mansion House Fuel Fund. The Dublin Simon Community and the Vincent De Paul are two main beneficiaries of the fund which was set up by Sir John Arnott in 1891 to assist the needy during a particularly hard winter. At the end of that winter, the surplus was carried over to the next year and the Mansion House Fuel Fund has continued to help the needy in Dublin since. It is one of the oldest charities in Dublin and is one of the earliest interdenominational charities in Ireland. The Mansion House Fuel Fund is the Lord Mayor’s only personal charity. Funds are raised through visitor donations at the Crib, an annual postage appeal and the Lord Mayor’s Annual Christmas Concert. Last Christmas, the Crib raised just over €19,000 and the Fund made approximately €80,000 in charitable donations. The tradition of a live animal crib is also alive and well in Brussels at the heart of the EU. From 29 November 2013 to 5 January 2014 on the Grand Place in Brussels there is a simple crib among the many high tech attractions at Winter Wonders. The crib , with a straw roof, is lit 24 hours a day and includes some sheep this year. The Dublin Crib is open to the public at the Mansion House until Christmas Eve from 11am to 6pm daily (Christmas Eve 11am to 2pm).